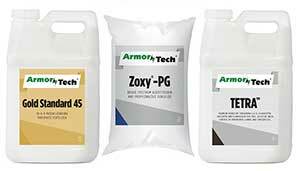 United Turf Alliance added three new product additions to its ArmorTech portfolio: ArmorTech Tetra, ArmorTech Gold Standard 45 and ArmorTech ZOXY-PG. ArmorTech Tetra is a premium herbicide containing 2,4-D, fluroxypyr, triclopyr and flumioxazin for fast, selective weed control in ornamental lawns and turfgrasses. The ester formulation offers early- and late-season control of weeds, including ground ivy and wild violet. This four-way herbicide provides control of more than 250 broadleaf weeds. ArmorTech Gold Standard 45 is a comprehensive plant health tool that delivers rapid, efficient plant uptake and utilization. Use of Gold Standard 45, either alone or as part of a spray program, will promote stronger, healthier turfgrass plants that can withstand intense maintenance and weather, according to the company. ArmorTech Zoxy-PG is a granular fungicide combining 0.31 percent azoxystrobin and 0.75 percent propiconazole. A broad-spectrum fungicide, it uses both root and leaf uptake to deliver preventive and curative control for up to 28 days. Zoxy-PG targets foliar, stem and root diseases, such as leaf and stem blights, leaf spots, patch diseases, anthracnose, fairy rings, mildews, molds and rusts of turfgrass.